Lee Angol scores one of Posh's 47 League One goals this season. Photo: Joe Dent/theposh.com. Peterborough United manager Graham Westley always has a stockpile of data to hand. He used it to disarm one shareholder at the club’s Annual General Meeting this week who had dared to moan about the number of scoring chances that Posh miss. Westley also explained that he makes selection decisions based on information received from his statistical analysts. 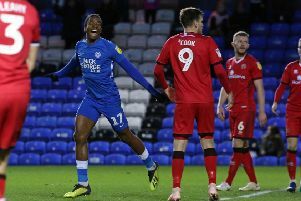 Despite their goal-less blip at Blackpool last Saturday (December 19), Posh are the leading scorers in the top four divisions of the Football League with 47 goals in 22 League One matches. Westley said: “There is a chart available to League One clubs which details who is best at converting scoring chances. “Bury are top of that chart with a goal from every seven chances created. We are second with one in every eight chances leading to a goal. “No team scores from every chance and that chart shows how hard it is to score goals. “Only now and again do you score from one in every three or four chances in a game. Obviously if we manage that we will score eight or nine! “I also have figures that show me how much each player is contributing to the team and that could be a factor in the way I select the team.